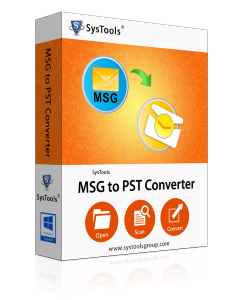 MSG to PST converter is a comprehensive utility developed for exporting MSG files to PST file. The software converts all the MSG files and saves them in a single PST file without making any changes to the data. The software facilitates bulk conversion of MSG files to PST format. Hundreds of MSG files are converted and stored in a single UNICODE type PST file whilst keeping the metadata of all the emails intact. The software automatically locates the MSG files stored in a folder and loads them after sorting the files from other file formats. It supports conversion of multiple MSG files altogether in a single PST file. MSG to PST Converter offers multiple views in order to preview scanned MSG files. The multiple views offered are Normal Mail, Hex, Attachments, MIME, RTF, HTML, Message Header and Properties View. MSG to Outlook Converter gives the option to Export selective MSG files to PST format. The users can check/uncheck the MSG files and can convert only the desired files to PST format without making any changes in formatting. Once the MSG files are scanned by MSG to PST Converter, they are displayed along with their attributes like From, To, Sent, Received, etc. These attributes of MSG file can be re-arranged by clicking on them. Software does not impose any 2 GB size limitation on the output PST file as the file is of UNICODE type. Therefore, the users can convert hundreds of MSG files to PST format without any data loss. The MSG to Outlook PST Converter gives the option to split the output PST files into multiple PST files. In case the user wants to have multiple PST files of same size, the user can select the PST Split option and do the same. In order to perform the MSG to PST conversion procedure, the users does not need to install MS Outlook in the machine. However, for accessing the output PST files later on, MS Outlook is necessary. MSG to Outlook converter provides option to switch screen mode, By default tool uses horizontal modes, if you want to view content vertically then select switch vertical mode. MSG is the file format offered by Microsoft in order to store individual Outlook emails. The MSG files are compound binary format file that requires a MAPI client in order to be accessed or viewed. It is not a simple text file and thus cannot be opened in a text editor like Notepad. The MSG files can be easily created by drag and drop technique. The Outlook users can drag and drop their emails and the emails are then saved by default as MSG files. At times, an Outlook user might require archiving some of the mails for accessing it in future. For this, the user can create a separate PST file and save the emails. However,the caveat to this process would be that the emails would not be copied to the archive PST file. Instead, they will be moved to the new PST. Hence, in case the user requires accessing the archive emails in the same PST file, it would not be possible. A workaround to this will be saving the PST file emails as MSG files. For every single email, an individual MSG file is created. Thus, this enables the user to create an archive of the Outlook emails and also keeps the original emails intact. Supports batch conversion of MSG files to PST format. Maintains the formatting of the MSG files intact once converted to PST. Automatically locates the MSG file from assortment of files and loads it. Option to split output PST file into multiple PST files of the same size. Provision to export selective MSG files to PST format. Is there any size limitation on the MSG files that have to be converted? No, the software imposes no size limit on the MSG files that need to be converted. Is MS Outlook installation necessary for performing conversion process? No, MS Outlook is not required to be installed for performing the Outlook messages to PST conversion. However, for accessing PST file Outlook will be necessary. Will the software convert all the attachments with the emails? Yes, the MSG to PST Converter will convert all the embedded attachments with the emails to PST format. Will the software easily run on Windows Vista? Yes, the software will easily run on all the versions of Windows OS, i.e. Windows 8.1 and all the below versions. The PST Split option in the software enabled us to create multiple PST files for all the bulk MSG files that we converted. We are really happy with the working of MSG file to PST converter.